Use: Worn as a Pin - No Comb NeededWorn in the Hair - Add Small Slide-on Comb (+2) This item is currently out of stock. 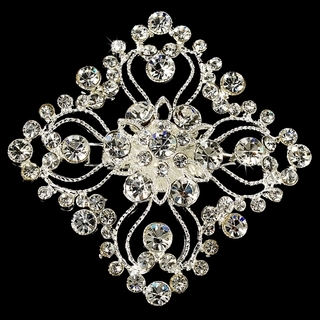 This elegant, silver-plated brooch is adorned with sparkling Swarovski crystals, making it the perfect vintage-style accessory for your wedding gown, bridesmaids' dresses, or bridal bouquet. It also makes a lovely Mother's Day, Christmas, or birthday gift! This versatile brooch can either be pinned on your gown or worn in your hair with one of our slide-on comb adaptors (+$2.00). Please use the drop-down menu to select your preference.